2 Bedroom Semi Detached House For Sale in Plymouth for Offers Over £150,000. FEATURED IN THE BIG OPEN HOUSE EVENT. 27th and 28th April - Please call 01752 362481 for viewing arrangements. 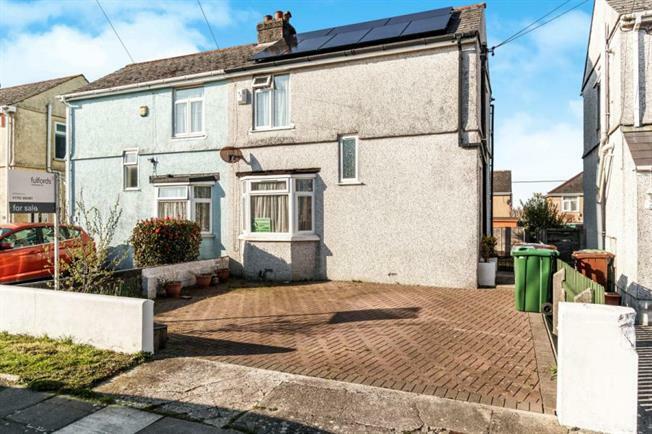 Guide of 150,000 to 160,000.Superbly presented and greatly improved semi detached home located in a popular and established area which would make an ideal first home. Benefitting from gas central heating, uPVC double glazing and roof mounted Solar Panels the accommodation includes a modern fitted kitchen, living room, large conservatory/dining room, two bedrooms and modern fitted bathroom. Outside there is off road parking at the front for several vehicles and an enclosed generous size rear garden. No onward chain, viewing highly recommended. UPVC entrance door. Stairs rising to the first floor. UPVC bay window facing the front and uPVC double doors leading to the conservatory. Radiator, laminate flooring. Modern fitted with ample base and wall units. Fitted work tops. Integrated oven and hob, plumbing and space for a washing machine and space for fridge freezer. UPVC window to the side and rear and door leading to the conservatory. Laminate flooring, uPVC windows facing the side and rear and double doors leading to the garden. Dual aspect with uPVC windows to the front and rear. Radiator. Modern fitted 3 piece suite including a low level WC, wash hand basin and panelled bath with shower over. Tiled walls, laminate flooring and radiator. UPVC double glazed window facing the side. Blocked paved off road parking at the front for several vehicles. Side access leads to the rear garden which is enclosed and mainly laid to lawn. Secure storage area beneath the conservatory and a timber garden shed.